It is 8:30 in the morning and eager elementary schoolkids line up laughing and chattering noisily. Each child is handed either a red, yellow, or black Rhythm, Sound & Motion Experience (RSME) t-shirt. Some start to fold the t-shirts and stow them into their backpacks, but they are told to change out of their white shirts and blouses of their signature school uniforms into the colored t-shirts. A bit puzzled, they are told they have 1 minute to change and to make their way over to the stage. The countdown begins…59, 58, 57… the kids get excited and frantic and race over to the stage, they clamber up the steps and take a seat feeling proud to have made it before the time ran out, with 20 seconds left on the clock, they are told to remove their shoes and socks. Screaming they leap up from their seats and rip off shoes and sticky socks—they make it back to their seats before the long drawn out 1 second is called. Laughing and giggling, I introduce myself and ask the children to look down at their tee-shirts and read what is written on them, like the good students they are, they read out the words in unison—Rhythm, Sound, & Motion Experience! Then I ask them what the words mean. Almost immediately, many hands shoot into the air, each wanting to answer the question. The teacher beams proudly as her students explain the meaning of the words on their t-shirts. Then I ask whose image they see on the t-shirts. They don’t know the man who is on their t-shirts with head thrown back, mouth open as if howling and wearing dark sunglasses. As I continue to speak, two elderly men, Joseph Bowie and Don Glasgo, both renowned in the jazz world, enter the gates of Stairway and walk onto the stage ready to begin a two-hour Rhythm, Sound and Motion Experience workshop with the students. Over the next 5 days, with two 2-hour workshops each day, Joseph and Don will have enhanced the lives of more than 200 children and adults from the local schools and Stairway Foundation. 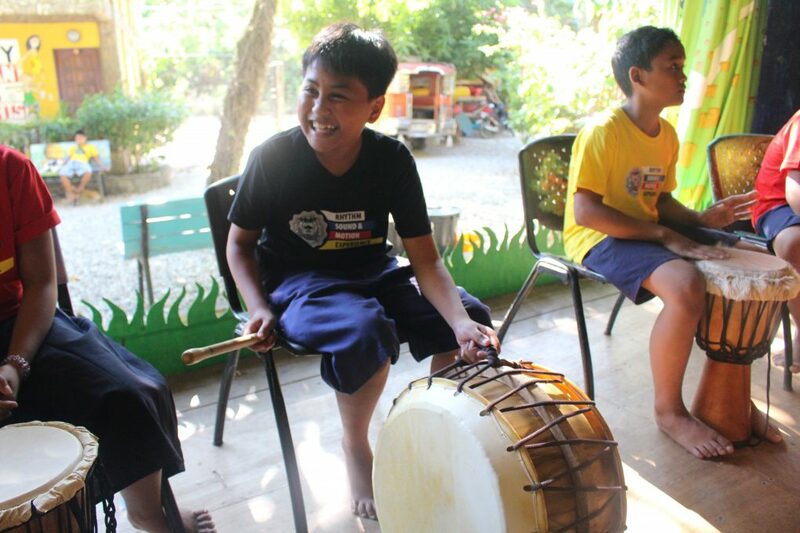 Student from Aninuan Elementary School enjoys playing a Korean barrel drum during the RSME workshop. 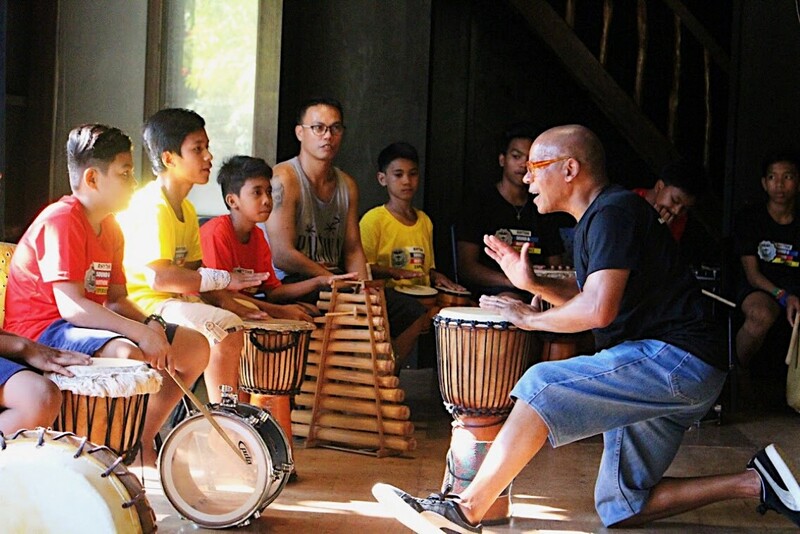 The Rhythm, Sound & Motion Experience (RSME) original workshop concept was designed by Joseph Bowie for musicians, but it soon evolved into a program for children and adults not only focusing on musical skills but also social and personal development. Utilizing specific training in Tai-Chi Temple exercises, vocal exercises, timing and rhythmic development and working with percussion utilizing djembe drums, RSME achieves a balanced, comprehensive yet enjoyable program to enhance the personal and social skills of children and adults. Thank you Joseph Bowie and Don Glasgo for sharing your musical magic and enhancing our community with your positive and unflagging energy!